Miss Singh: GIMME SOME GOLD!! I am back with my second post on my adventure to Dubai! 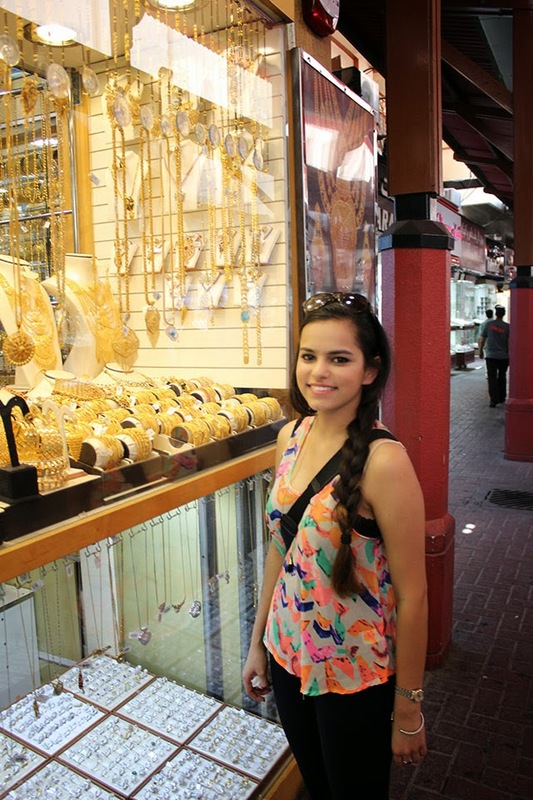 One thing I planned to do on my visit to Dubai was visit the Gold Souk. Dubai is also known as the “Land of Gold”, so we were bound to go there. As you enter the souk, gold is everywhere! The lanes are filled with hundreds of jewelry shops and the most interesting part is the way the gold is displayed in the windows. It is eye popping, is the best way I can describe it! The designs are absolutely unique and something you cannot see anywhere in the world. Further into the souk, we saw small shops selling kaftans, shoes and some more trinkets like magnets, bags, teacups, hookahs, and so much more! We also saw some pretty, traditional carpets. Even if you don’t buy anything, I highly recommend checking it out because it's something worth seeing and unlike anything you have witnessed before! After the Gold souk, I was ready to buy something that was a little more affordable and wouldn’t burn a hole in my pocket! We ended up going to the largest mall in the world, Dubai Mall. Boy oh boy, I have never seen a shopping mall so vast and huge. The Dubai Mall houses every designer and store possible. It is unbelievable!! It was a real experience. The most interesting part of the mall is the built in aquarium and a waterfall. I think everyone who visits Dubai should most definitely visit The Dubai Mall just for these two attractions, if not for the shopping. Lets talk about the food now, people! After all the shopping, I needed some food in my system. Now, if you are in Dubai, you need to get some authentic Lebanese food, which is exactly what we craved for. We ended up going to Alsafadi. Not only was the food absolutely delicious, it was affordable. We ended up ordering the best homemade hummus topped with minced meat and pine nuts, salads, lamb, fish, chicken wings, and what not. For dinner, we chose to go to Le Petite Maison. A very famous and talked about restaurant, Le Petite Maison serves a mix of French and Mediterranean cuisine. The food was incredible and the ambience inviting. For starters, we ordered Burrata with tomatoes and basil and White Beans with truffle vinaigrette. For our main course, we went with something different. Escargots à la Bourguignonne. (Snails, if you want to be non-fancy). I had not tried escargots before, but took the plunge and enjoyed them thoroughly. We also ordered the grilled cod, rib eye steak, and some grilled tiger prawns. The food was A+, but a bit pricey. However, it was well worth it. I would add more pictures but it was pretty dark in there. After dinner I wanted to check out a little bit of the night life and ended up going to a lounge next to the restaurant, called Roberto’s, which was very trendy and really catered to the young. It had great music and a fun atmosphere. I would visit it again. Last stop to end the evening was Buddha Bar, which was super fancy and had an exceptional atmosphere. I couldn’t leave Dubai without visiting this much talked about lounge bar. I also recommend going to Qbara. We had dinner there the last day and it was amazing! It’s always a great bar and lounge to hang out in case you want to just go and grab a drink! I would have to say that my trip to Dubai was one filled with fun, food, sightseeing, shopping, culture and most importantly spending time with my family. I can’t wait to share more travel adventures and experiences with all of you! Amazing pictures! Glad you had a lovely trip, Dubai looks amazing! Thanks Louise! :) It was amazing!! Will check your blog out! !